Like many of my generation, life changed a bit when Sputnik was launched in October, 1957. While many of my classmates were interested in rocketry, my own interest was more in the field of electronics – the instruments needed to make measurements of temperature, pressure, and other data that was then sent back to Earth by radio. Because I was an amateur radio operator at the time (K9SRW) who built all my own equipment, this was a natural extension of then-current interests. I remember walking part way home from high school just so I could stop at a local Army surplus store packed with boxes of resistors, capacitors, and other components including the transistors needed to build amplifiers, oscillators, and other circuits one might need. The finished payload was a cube about 30 cm on a side, and I built two of them – one in Styrofoam for launch, and one in clear plastic for testing and display for a science fair at my high school. I called the experiment Project HiBall (for high balloon, of course) and on launch day I just hoped everything worked. Fortunately, the experiment was a success. The balloon headed west, and landed a day later on a farm in Iowa where a kind farmer found it and sent it to me. 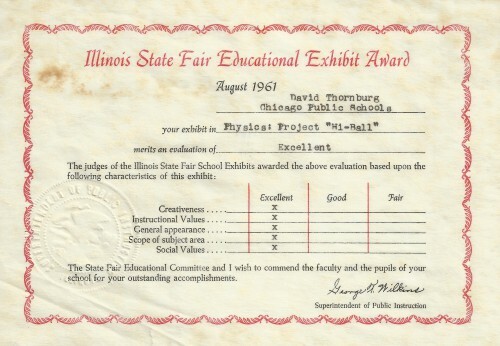 The data was not earth-shattering, but the experiments mostly worked as planned and the resulting science fair project was well-received, taking me to the State finals. While my interest in STEM subjects had already been formed, there is little question that this project strengthened these interests, setting the trajectory for my continued education. The reason I shared this experience with you is because, today, even more amazing options are available. The first technology to mention is the CubeSat- small (10 cm/side, about 1 kg)) satellites for student projects that stay in low-earth orbits for about a year (www.nasa.gov/mission_pages/cubesats/). While most of the projects are done by college students, there is a special opportunity to expand this access to high school students. This project (ArduSat – http://www.ardusat.com) is based on the popular Arduino board used to send and receive data from all kinds of sensors and actuators. 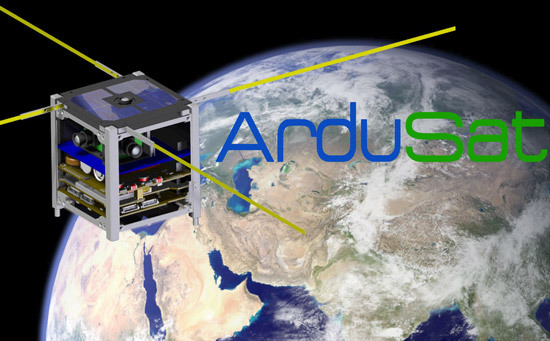 While most Arduino projects reside here on Earth, the Ardusat system lets students design and test experiments in their classroom that can then be sent to an Arduino-based CubeSat for testing in space. From my historical perspective, this is staggering! The Arduino board connects to a computer and has numerous inputs and outputs for both digital and analog data. The Ardusat student kit includes some special sensors for luminosity, temperature, an accelerometer, gyroscope, magnetometer, barometer, UV sensor, infrared thermopile and other data sources. The whole kit is only $150 which is a bargain considering the specialized sensors it contains. While experiments can be designed and tested here on Earth, finished Arduino programs can be sent 450 km up to the Ardusat where experiments can be done and the data sent to Earth. This goes way beyond what I was doing in 1961 in two very important ways. First, the experiments are done on an orbiting satellite. Second, the projects can be done by students without them having to design all the sensors and other equipment themselves. This has the effect of democratizing the endeavor, bringing an amazing opportunity for STEM education to students everywhere. In addition to the hardware kits, Ardusat also has a lot of activities and experiments that can be downloaded and explored – including tutorials on the hardware itself. This material is generally released under a Creative Commons copyright, making it perfect for free classroom use. In addition to the tutorials and other resources, the activities are keyed to both the Next Generation Science and the Common Core Standards. This adds value in that teachers can see how Ardusat projects tie into the standards they are expected to support without having to wade through the massive standards documents themselves. There is no question in my mind that the project I did ages ago helped guide me into the sciences. What excites me more is that projects like Ardusat will achieve this result for thousands of kids who well then go on to invent our future. One of my major concerns with all the current interest in STEM education is that the bulk of the efforts I’ve seen are focused on the Science and Math parts of the topic, with Technology and Engineering taking a back seat to everything else. To me, Technology goes way beyond using computers to create documents, but includes the ability to build one’s own programs from scratch. On the engineering side, my feeling is that kids need more opportunities to invent and build things with their hands – engaging in the kind of tinkering most engineers get to do. There are, of course, many schools that do offer a balanced approach to STEM, and they are to be applauded. But there are many more who do not offer the richness that hands-on construction affords. We have libraries to enrich kids heads. Does your school have workshops where they can enrich their hands and minds together? The situation is made even worse for many kids who are having trouble in school, since they are often funneled into even more draconian rote-learning environments rather than being given the chance to explore learning in ways that might well be more natural to them. My bias is home grown. I’ve been an electronics tinkerer since I was a little kid. I used to find old radios that I would take apart for their parts, some of which ended up in projects of my own design. I had no teachers helping me – I just figured things out for myself, with the support of my folks who helped provide me with the tools of construction, some of which I still use today. Of course my tinkering took place decades before personal computers were invented. Programming was replaced by building. And, yes, I made plenty of mistakes and did some stupid things – but, through it all I learned a lot. By the time I got my PhD and started working at the Xerox Palo Alto Research Center, I had developed both my hands and my mind. Since (among other things) I have degrees in engineering, both of these domains got a good workout. For example, one design methodology I learned (once the personal computer came into existence) was that there was a decision one made as a designer as to which tasks were better done in software, and which ones were best done with hardware. Since I worked in both fields, this kind of thinking made great sense to me. But this trip down memory lane has a point – simply that far too many young people would have no idea what I’m talking about. But this can change, almost for free. Furthermore, it can change in ways that are appropriate for young children as well as for adults – all using the same tools. First, on the programming front, the Scratch language from MIT is accessible to all and, through its construction-set metaphors, builds good programming habits if students decide to learn more traditional languages later. This free tool can address a lot of the missing materials on the Technology side of STEM. On the Engineering side of STEM, one amazing and inexpensive tool is the Arduino programmable controller. This open source piece of hardware acts as the interface between the computer and (for example) a robot built by a student with a few parts and recycled materials. Basically, you create a program for the Arduino that will sense inputs of various types (light, sound, physical pressure, temperature, etc. )and then, based on your program design, run motors, control lamps, and do myriad things limited only by your imagination. While you are free to build your own Arduino system from scratch, most choose to purchase a fully assembled board (shown above) for about $30, or $TB 0.1 (one tenth the cost of a traditional textbook) from vendors like Sparkfun whose catalog also includes all the other electrical components you might need for your projects. Even RadioShack has jumped on the Arduino bandwagon! 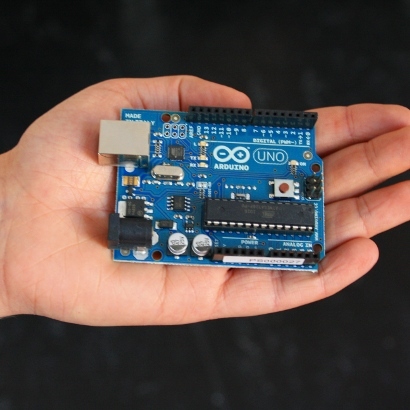 As for programming the Arduino, the free software from the Arduino site contains all you need to create programs to be downloaded to your board. But, the language in which these programs are written is not as easy to master as languages like Scratch. 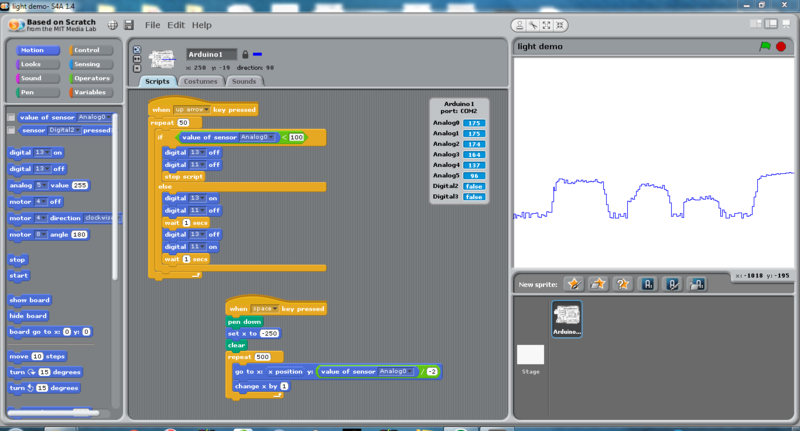 Not to worry – there is a special version of Scratch for the Arduino device (Scratch for Arduino). By connecting your Arduino to the USB port of your computer and creating programs in this version of Scratch, you’ve opened the door for Technology and Engineering education in some pretty powerful ways. The screen above shows a couple of programs that cause lights to blink in sequence, and to plot the level of light hitting a photocell used to turn the lights off. I could have just as easily created a Scratch program to run an electric car that follows an arbitrary line drawn on the floor – or to have a robot solve a maze – or just about anything else. Now while the Arduino does not have enough power to run most motors directly, motor driver circuits can be built using about a quarter’s worth of parts. Once kids get started with the Arduino, they suddenly develop an interest in learning to use multimeters, oscilloscopes, and a bunch of other tools (including soldering irons.) They start to view the world of the made through new eyes once they have learned to make things themselves. So, when it comes to STEM education, I think we should get serious or go home. The tools are there along with amazingly rich libraries of support materials. It is beyond time for us to realize that Science and Math alone do not a STEM curriculum make.